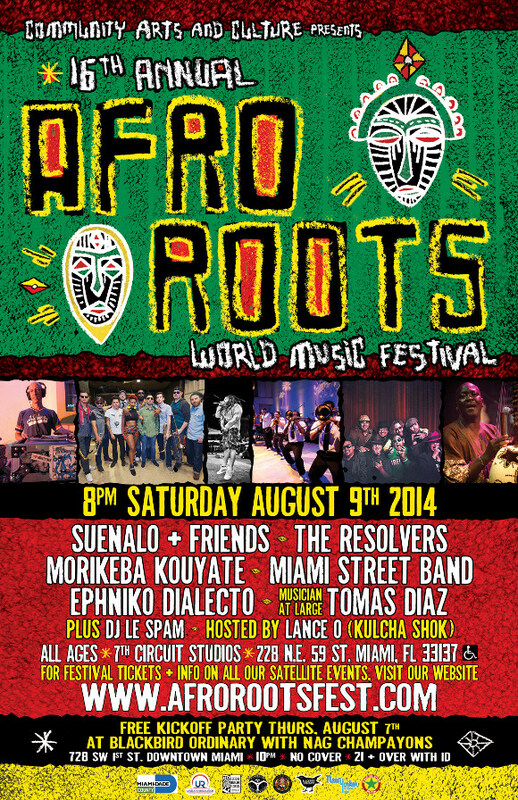 Saturday, August 9th 2014 – 8 p.m. In recent years, the festival has expand its reach beyond the local South Florida artists scene by bringing in African performers from countries such as Senegal, Ivory Coast, Guinea, Mali, and the Republic of Congo. This global connection through music has helped the festival evolve into one of Miami’s most culturally diverse events. Morikeba Kouyate is a seventh-generation Jali (Griot) who has performed professionally for more than thirty years throughout the U.S. and internationally as a solo artist, enticing audiences young and old with exciting music and engaging stories. He performs in his traditional Mandingo language, providing translations in English and French. Kouyate’s two releases, The Music of Senegal and Mandingo Royals & Warriors Folklore are traditional and contemporary songs and stories which share the 700+ year history of the Mandingo people. Suenalo’s “AfroLatinBabymakin’DescargaFunk” has been literally moving fans since the band’s inception in the early 2000s, positioning them among the most-popular acts originating in Miami and making their performance a top local draw. Their unique mash-up of Latin, Afro-Caribbean, funk, hip-hop and R&B influences today defines the “Miami sound” and has earned them much press coverage and accolades such as the Miami New Times’ Best of awards for “Best Latin Rock Band” and “Best Latin Band”. Their releases include Collages (2003), 2006’s Suenalo, 2009’s Live at Transit and this year’s single “305”, which precedes an upcoming new full-length. The Resolvers coined the phrase “Big Band Reggae” to describe their sound, which combines classic Jamaican roots and lively New Orleans stylings. Brother and sister Ojay and Sahara Smith (children of Ernie Smith) both take turns on lead vocals, fronting the band that features a blistering four-piece horn section. Their live shows have been described as “explosive” and “must see” and the band has gained the reputation as a premier reggae act. The band released an EP called Big Band Reggae in 2012 and continue to tour nationally in support of it. Ephniko is a bilingual songwriter, DJ and emcee originally from Columbia and now residing in Miami. His style has been compared to Mos Def, the Orishas and Damian Marleyand is a self-described “hip-hop educator/researcher” who does workshops with youth programs at area festivals, juvenile detention centers and schools. Ephniko released his debut Escribo Lo Que Vivo in 2008, a mixtape called Dig in 2010 and his music has been featured on more than a dozen and compilations since. He continues to DJ and tour South America to this day. The Miami Street Band is probably best-recognized for their on-court performances in the NBA as the Miami HEAT Street Band. They play everything ranging from pop, Latin, hip-hop, R&B and even custom songs based on requests. Not just musicians, they are entertainment group who dance to every song, perform intricate routines and even provides crowd interaction from sing-a-longs to limbos. The Miami Street Band can range in size from 10-50 players. Andrew Yeomanson is also known as DJ Le Spam, musicologist and founder / leader of the Spam Allstars. An extremely skilled musician, he also played guitar and toured in local legend Nil Lara’s band and today serves as producer for local and international acts from his North Miami-based City of Progress Studio. His vinyl collection numbers more than 10,000 and covers a broad spectrum of genres from Latin to funk, Afrobeat, hip-hop and R&B. He and his group tour the U.S. constantly, playing large music festivals, and are currently working on a new release, the highly-anticipated follow-up to the 2007’s Electrodomesticos.